Are you looking for a delicious mackerel recipe with a difference? If you are, you’ve found it! 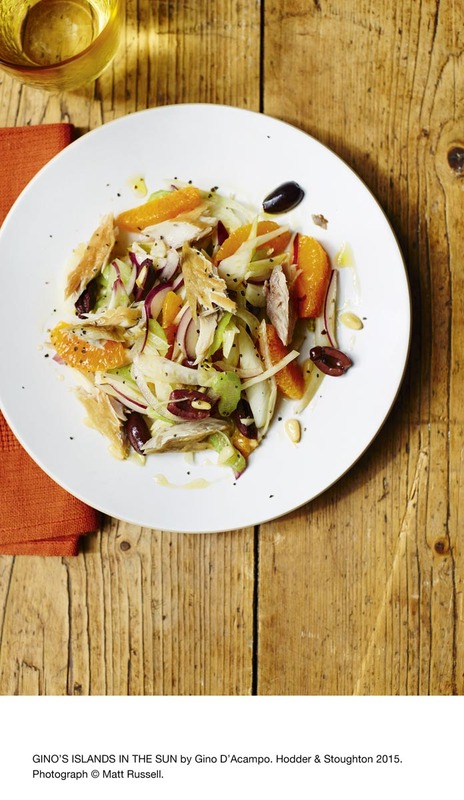 Here’s my smoked mackerel, orange & fennel salad for you to enjoy. 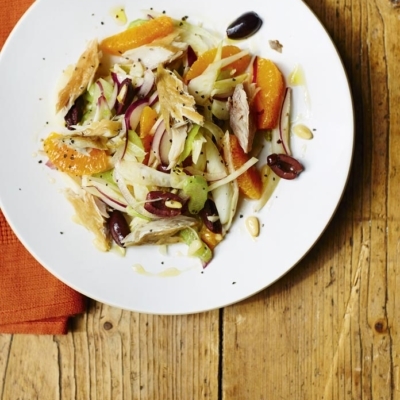 Feast your eyes on the finest smoked mackerel, orange & fennel salad! It’s straightforward and fun to make this great dish. Simply follow the instructions below and get the perfect result. First peel and segment the oranges. Using a sharp knife, cut off about 1-2cm from the top and bottom of the fruit. Place the fruit on one of its flat ends and cut down to remove the skin and white pith. Rotate and repeat, working your way around the fruit until the flesh is completely exposed. Working over a large bowl, cut between the flesh and the white membrane to free the segments. Discard the membrane and put the segments into the bowl (the bowl should also catch the juice). Add the fennel, onion, olives, celery and pine nuts to the bowl with the orange segments and juice. Stir carefully to combine. To make the dressing, put the vinegar and honey in a small bowl. Gradually add the oil, whisking vigorously as you go, and season with salt. Pour the dressing over the salad (reserving 1 tablespoon for drizzling) and gently toss all the salad ingredients together. Break the mackerel into bite-sized pieces and scatter over the top of the salad. Sprinkle with black pepper and drizzle over the remaining dressing. 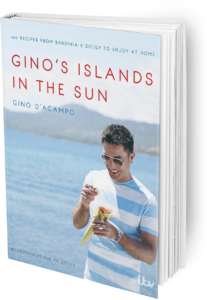 Once you’re done, simply sit back and enjoy your smoked mackerel, orange & fennel salad and don’t forget to check out other great authentic Italian recipes including great antipasti recipes, Italian pasta recipes, Italian soup recipes, Italian beef dishes and authentic pizza recipes.